Banana bread has kind of been floating in and out of my head. I have a memory of baking it with my mom once. While getting my post-workout Saturday latte at the nearby coffee shop, Portland Brew, I always notice their banana bread in these cute little molds. I rarely buy the snacks at coffee shops because I enjoy making stuff like that on my own. The other day my friend Liesl gave me a banana that was pretty ripe, and I already had two that were getting there, and a ripe one in the freezer. At first I was just going to slice it and freeze it for smoothies, but then I realized I’ve never posted a recipe for banana bread. 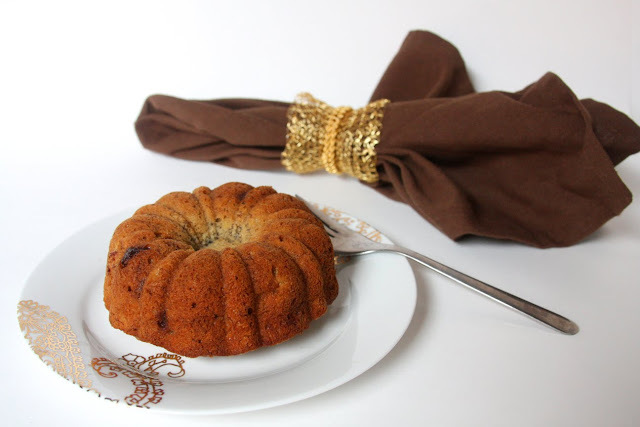 I have a stoneware mini bundt pan I had only used once, so I thought it seemed like a great non-traditional way to bake banana bread, just like the ones at the coffee shop! It’s makes it perfect for giving away, because I ended up with 5 of them. I brought 3 into work, The Boy & I ate one, and gave the other away. I also loved that slicing it gave these small portions, which are great if someone only wants just a bite. I know there are SO MANY banana bread recipes out there, and I checked to see if I had any bookmarked. I found this one, on my friend Melissa’s blog. I used that recipe as a starting off point, and varied it up just a bit. I used some white whole wheat flour to make it a little healthier. Then I added chocolate chips, to make it unhealthier! Haha.. And I realized I didn’t have enough bananas, so to make up for that I subbed nonfat greek yogurt. I must admit I was a little worried it wouldn’t turn out. But I was proven wrong when this banana bread turned out very moist & delicious! The chocolate chips melted and really paired nicely with the banana flavor. There’s just something so nice about a freshly baked homemade quick bread. Preheat oven to 350 degrees F (175 degrees C). Lightly grease a 9x5 inch loaf pan (or mini bundt pans like mine). In a large bowl, combine flours, baking soda and salt. In a separate bowl, cream together butter and brown sugar. Stir in eggs and mashed bananas until well blended. Stir banana mixture into flour mixture; stir just to moisten, and add in chocolate chips. Pour batter into prepared loaf pan. Oooh it looks so pretty as a bundt instead of a loaf! I never get sick of banana bread. I love the little cakes, was this a pampered chef pan by chance?! 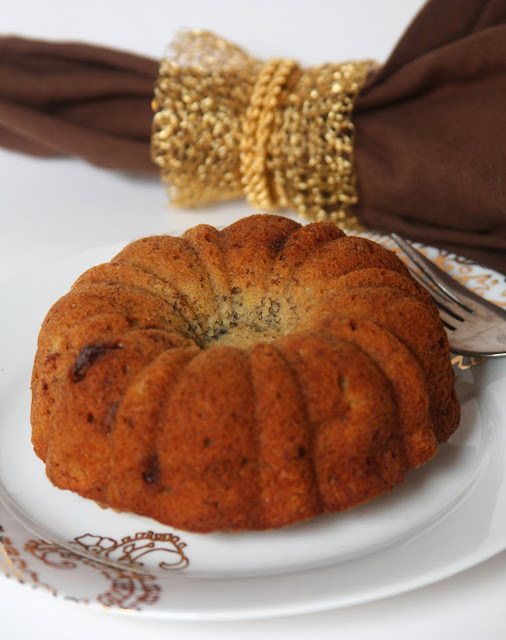 What a pretty bundt bread – great idea! We always enjoy a good banana bread, but I've never made it with chocolate chips – yum! Love it in bundt form. Makes it look extra special. 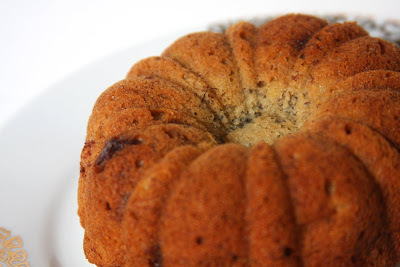 I love the idea of making it in the bundt pan!! Makes it so much more fancy 🙂 I think I may do this myself! I love how pillowy it looks!